The Virginia State Bar Young Lawyers Conference has named Chuck Slemp as this year’s R. Edwin Burnette, Jr. Young Lawyer of the Year Award. The award recognizes young lawyers who demonstrate dedicated service to the conference, the legal profession, and the community. It will be presented on June 15, 2018, at the Virginia State Bar Annual Meeting in Virginia Beach. Slemp, Commonwealth’s Attorney for Wise County and the City of Norton, was elected in November of 2015 and currently manages an office of nine attorneys while working with state and local law enforcement officers and citizens to prosecute those who break the law. Prior to his service as Commonwealth’s Attorney, Slemp served as Commissioner of Accounts for Wise County and the City of Norton and as General Receiver for the Circuit Court of Wise County. He also practiced criminal, domestic relations law, and estate administration in Southwest Virginia and Northeast Tennessee. Slemp has a proven commitment to public service. He is currently a member of the Board of Directors of the Virginia Association of Commonwealth’s Attorneys, the Virginia Criminal Justice Conference, the Virginia YMCA Model General Assembly, and Norton Community Hospital. In the past few years, he has given dozens of lectures for continuing legal education seminars across the state, published several law review articles, and has been published in various newspapers. 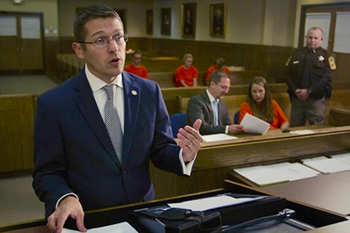 Slemp is noted for initiating various programs designed to create greater efficiencies in the criminal justice system and to promote public safety in Southwest Virginia. In 2016, Slemp launched the "Courts to Classrooms" program, that provides educational experiences for area students. In 2017, Slemp created the "Southwest Virginia Joint Senior Abuse Task Force" to address crimes against senior citizens and the "Wise Works" program to provide alternative sentencing options for low-risk offenders. He has also worked to address the region's substance abuse crisis, to protect seniors from financial exploitation, and to safeguard children from abuse and neglect. Slemp holds an undergraduate degree from the University of Virginia’s College at Wise and holds both a Juris Doctor and a Masters in Government, Law & Public Policy from Regent University. He currently teaches at Regent University School of Law, and has also been an adjunct professor at the University of Virginia’s College at Wise, Mountain Empire Community College, Regent University Robertson School of Government, Virginia Highlands Community College, and Tidewater Community College.